Between 2009 and 2012, the federal government recorded the largest budget deficits relative to the size of the economy since 1946, causing federal debt to soar. Federal debt held by the public is now about 73 percent of the economy’s annual output, or gross domestic product (GDP). That percentage is higher than at any point in U.S. history except a brief period around World War II, and it is twice the percentage at the end of 2007. If current laws generally remained in place, federal debt held by the public would decline slightly relative to GDP over the next several years, CBO projects. After that, however, growing deficits would ultimately push debt back above its current high level. 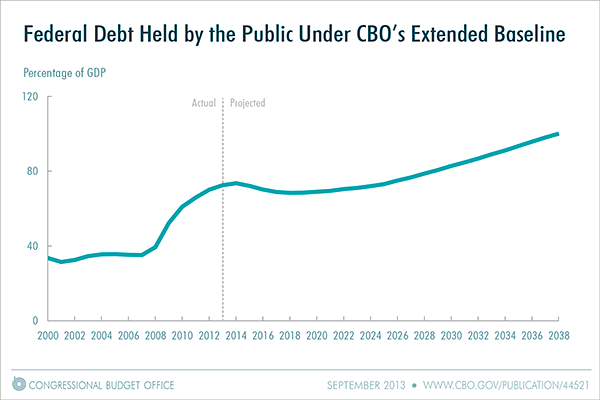 CBO projects that federal debt held by the public would reach 100 percent of GDP in 2038, 25 years from now, even without accounting for the harmful effects that growing debt would have on the economy (see the figure below). Moreover, debt would be on an upward path relative to the size of the economy, a trend that could not be sustained indefinitely. However, budget deficits would gradually rise again under current law, CBO projects, mainly because of increasing interest costs and growing spending for Social Security and the government’s major health care programs (Medicare, Medicaid, the Children’s Health Insurance Program, and subsidies to be provided through health insurance exchanges). CBO expects interest rates to rebound in coming years from their current unusually low levels, sharply raising the government’s cost of borrowing. In addition, the pressures of an aging population, rising health care costs, and an expansion of federal subsidies for health insurance would cause spending for some of the largest federal programs to increase relative to GDP. By 2023, CBO projects, the budget deficit would grow to almost 3½ percent of GDP under current law, and federal debt held by the public would equal 71 percent of GDP and would be on an upward trajectory. 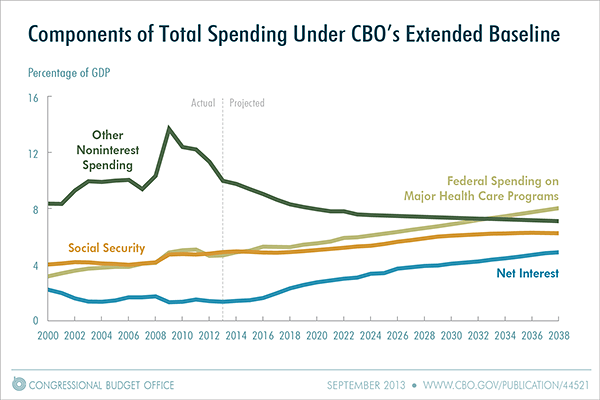 Looking beyond the 10-year period covered by its regular baseline projections, CBO produced an extended baseline for this report that extrapolates those projections through 2038 (and, with even greater uncertainty, through later decades). Under the extended baseline, budget deficits would rise steadily and, by 2038, would push federal debt held by the public close to the percentage of GDP seen just after World War II—even without factoring in the harm that growing debt would cause to the economy. The federal government’s net interest payments would grow to 5 percent of GDP, compared with an average of 2 percent over the past 40 years, mainly because federal debt would be much larger. Federal revenues would equal 19½ percent of GDP by 2038 under current law, CBO projects (see the figure below), compared with an average of 17½ percent over the past four decades. Revenues are projected to rise from 15 percent of GDP last year to 17½ percent in 2014, spurred by the ongoing economic recovery and changes in provisions of tax law (including the expiration of lower income tax rates for high-income people, the expiration of a temporary cut in the Social Security payroll tax, and the imposition of new taxes). After 2014, revenues would increase gradually relative to GDP, largely because growth in income beyond that attributable to inflation would push taxpayers into higher income tax brackets over time. The gap between federal spending and revenues would widen steadily after 2015 under the assumptions of the extended baseline, CBO projects. By 2038, the deficit would be 6½ percent of GDP, larger than in any year between 1947 and 2008, and federal debt held by the public would reach 100 percent of GDP, more than in any year except 1945 and 1946. With such large deficits, federal debt would be growing faster than GDP, a path that would ultimately be unsustainable. Incorporating the economic effects of the federal policies that underlie the extended baseline worsens the long-term budget outlook. The increase in debt relative to the size of the economy, combined with an increase in marginal tax rates (the rates that would apply to an additional dollar of income), would reduce output and raise interest rates relative to the benchmark economic projections that CBO used in producing the extended baseline. Those economic differences would lead to lower federal revenues and higher interest payments. With those effects included, debt under the extended baseline would rise to 108 percent of GDP in 2038. Increased borrowing by the federal government would eventually reduce private investment in productive capital, because the portion of total savings used to buy government securities would not be available to finance private investment. The result would be a smaller stock of capital and lower output and income in the long run than would otherwise be the case. Despite those reductions, however, the continued growth of productivity would make real (inflation-adjusted) output and income per person higher in the future than they are now. Federal spending on interest payments would rise, thus requiring larger changes in tax and spending policies to achieve any chosen targets for budget deficits and debt. The government would have less flexibility to use tax and spending policies to respond to unexpected challenges, such as economic downturns or wars. The risk of a fiscal crisis—in which investors demanded very high interest rates to finance the government’s borrowing needs—would increase. Most of the projections in this report are based on the assumption that federal tax and spending policies will generally follow current law—not because CBO expects laws to remain unchanged but because the budgetary implications of current law are a useful benchmark for policymakers when they consider changes in laws. If tax and spending policies differed significantly from those specified in current law, budgetary outcomes could differ substantially as well. 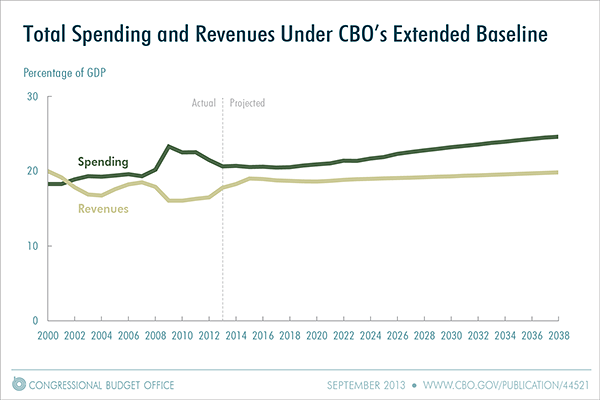 To illustrate the extent of that difference, CBO analyzed the effects of some additional sets of fiscal policies. Under one set of alternative policies, referred to as the extended alternative fiscal scenario, certain policies that are now in place but that are scheduled to change under current law would continue instead, and some provisions of current law that might be difficult to sustain for a long period would be modified. With those changes to current law, deficits (excluding the government’s interest costs) would be a total of about $2 trillion higher over the next decade than in CBO’s baseline; in subsequent years, such deficits would exceed those projected in the extended baseline by rapidly growing amounts. The harmful effects on the economy from the resulting increase in federal debt would be partly offset by lower marginal tax rates. Nevertheless, in the long run, output would be lower and interest rates would be higher under that set of policies than under the extended baseline. With those economic changes incorporated, federal debt held by the public would reach about 190 percent of GDP by 2038, CBO projects. In a different illustrative scenario, deficit reduction would be phased in such that deficits excluding interest costs would be a total of $2 trillion lower through 2023 than in the baseline, and the reduction in the deficit as a percentage of GDP in 2023 would be continued in later years. In that case, output would be higher and interest rates would be lower over the long run than in the extended baseline. Factoring in the effects of those economic changes on the budget, CBO projects that federal debt held by the public would be 67 percent of GDP in 2038, close to its percentage in 2012. Under a third scenario, with twice as much deficit reduction—a $4 trillion reduction in deficits excluding interest costs through 2023—CBO projects that federal debt held by the public would fall to 31 percent of GDP by 2038, slightly below its percentage of GDP in 2007 (35 percent) and its average percentage over the past 40 years (38 percent). Those different scenarios for fiscal policy would also have different effects on the economy in the short term. During the next several years—when the nation’s economic output will probably remain below its potential, or maximum sustainable, level—the spending increases and tax reductions in the alternative fiscal scenario (relative to what would happen under current law) would increase the demand for goods and services and thereby raise output and employment. The reductions in deficits under the other illustrative scenarios, by contrast, would decrease the demand for goods and services and thereby reduce output and employment. Even if the tax and spending policies specified in current law continue, budgetary outcomes will undoubtedly differ from CBO’s current projections as a result of unexpected changes in the economy, demographics, and other factors. Because the uncertainty of budget projections increases the farther the projections extend into the future, this report focuses on the next 25 years. To illustrate the uncertainty of those projections, CBO examined how altering its assumptions about future productivity, interest rates, and federal spending on health care would affect the projections in the extended baseline. Under those alternative assumptions—which do not cover the full range of possible outcomes—federal debt held by the public in 2038 could range from as low as 65 percent of GDP (still elevated by historical standards) to as high as 156 percent of GDP, compared with the 108 percent of GDP projected under the extended baseline with the economic effects of fiscal policy included. Those calculations do not address other sources of uncertainty, such as the risk of an economic depression or major war or the possibility of unexpected changes in birth rates, life expectancy, immigration, or labor force participation. Nonetheless, CBO’s analysis shows that under a wide range of possible assumptions about some key factors that influence federal spending and revenues, the budget is on an unsustainable path. The unsustainable nature of the federal government’s current tax and spending policies presents lawmakers and the public with difficult choices. Unless substantial changes are made to the major health care programs and Social Security, those programs will absorb a much larger share of the economy’s total output in the future than they have in the past. Even with spending for all other federal activities on track, by the end of this decade, to represent the smallest share of GDP in more than 70 years, total federal noninterest spending would be larger relative to the size of the economy than it has been, on average, over the past 40 years. The structure of the federal tax code means that revenues would also represent a larger percentage of GDP in the future than they have, on average, in the past few decades—but not large enough to keep federal debt held by the public from growing faster than the economy starting in the next several years. Moreover, because federal debt is already unusually high relative to GDP, further increases in debt could be especially harmful. To put the federal budget on a sustainable path for the long term, lawmakers would have to make significant changes to tax and spending policies—letting revenues rise more than they would under current law, reducing spending for large benefit programs below the projected levels, or adopting some combination of those approaches. The size of such changes would depend on the amount of federal debt that lawmakers considered appropriate. For example, bringing debt back down to 39 percent of GDP in 2038—as it was at the end of 2008—would require a combination of increases in revenues and cuts in noninterest spending (relative to current law) totaling 2 percent of GDP for the next 25 years. (In 2014, 2 percent of GDP would equal about $350 billion.) If those changes came entirely from revenues, they would represent an increase of 11 percent relative to the amount of revenues projected for the 2014–2038 period; if the changes came entirely from spending, they would represent a cut of 10½ percent in noninterest spending from the amount projected for that period. In deciding how quickly to carry out policy changes to make the size of the federal debt more sustainable, lawmakers face other trade-offs. On the one hand, waiting to cut federal spending or raise taxes would lead to a greater accumulation of debt and would increase the size of the policy adjustments needed to put the budget on a sustainable course. On the other hand, implementing spending cuts or tax increases quickly would weaken the economy’s current expansion and would give people little time to plan for and adjust to the policy changes. The negative short-term effects that deficit reduction has on output and employment would be especially large now, because output is so far below its potential level that the Federal Reserve is keeping short-term interest rates near zero and could not lower those rates further to offset the impact of changes in spending and tax policies. This entry was posted in Criminal activities our Elected officials do, Government Fraud, My Thoughts, Pork Programs, Stupid Bills, Stupid things our government does, Wasteing our tax dollars.